For the former restaurant, see Soup Kitchen International. A soup kitchen, meal center, or food kitchen is a place where food is offered to the hungry usually for free or sometimes at a below-market price. 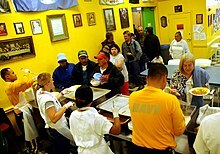 Frequently located in lower-income neighborhoods, soup kitchens are often staffed by volunteer organizations, such as church or community groups. Soup kitchens sometimes obtain food from a food bank for free or at a low price, because they are considered a charity, which makes it easier for them to feed the many people who require their services. Many historical and typical modern soup kitchens serve only soup (hence its name), usually with some bread. But several establishments which refer to themselves as a "soup kitchen" also serve other types of food, so social scientists sometimes discuss them together with similar hunger relief agencies that provide more varied hot meals, like food kitchens and meal centers. While societies have been using various methods to share food with the hungry for millennia, the first soup kitchens in the modern sense may have emerged in the late 18th century. By the late 19th century, they were located in several American and European cities. In the United States and elsewhere, they became more prominent in the 20th century, especially during the Great Depression. With the much improved economic conditions that immediately followed World War II, soup kitchens became less widely used, at least in the advanced economies. In the United States, there was a resurgence in the use of soup kitchens following the cutbacks in welfare that were implemented in the early 1980s. In the 21st century, the use of soup kitchens expanded in both the United States and Europe, following lasting global increases in the price of food which began in late 2006. Demand for their services grew as the Great Recession began to worsen economic conditions for those with lower incomes. In much of Europe, demand further increased after the introduction of austerity-based economic policies from 2010. The earliest occurrences of soup kitchens are difficult to identify. Throughout history, societies have invariably recognized a moral obligation to feed the hungry. The philosopher Simone Weil wrote that feeding the hungry when one has resources to do so is the most obvious obligation of all. She also said that as far back as Ancient Egypt, it was believed that people needed to show they had helped the hungry in order to justify themselves in the afterlife. Soup has long been one of the most economical and simple ways to supply nutritious food to large numbers of people. Social historian Karl Polanyi wrote that before markets became the world's dominant form of economic organisation in the 19th century, most human societies would generally either starve all together or not at all; because, communities would naturally share their food. As markets began to replace the older forms of resource allocation such as redistribution, reciprocity, and autarky, society's overall level of food security would typically rise. But food insecurity could become worse for the poorest section of society, and the need arose for more formal methods for providing them with food. Christian churches traditionally provided food for the hungry since Late Antiquity, with the nourishment mainly provided in the form of soup. The earliest modern soup kitchens were established by the inventor Sir Benjamin Thompson, who was employed as an aide-de-camp to the Elector of Bavaria in the 1790s. Thompson was an American loyalist refugee from New England, and an inventor who was ennobled by Bavaria as Count Rumford. The Count was a prominent advocate of hunger relief, writing pamphlets that were widely read across Europe. His message was especially well received in Great Britain, where he had previously held a senior government position for several years and was known as "the Colonel". An urgent need had recently arisen in Britain for hunger relief, due to her leading role in driving the Industrial Revolution. While technological development and economic reforms were rapidly increasingly overall prosperity, conditions for the poorest were often made worse, as traditional ways of life were disrupted. In the closing years of the 18th century, soup kitchens run on the principles pioneered by Rumford were to be found throughout England, Wales, and Scotland, with about 60,000 people being fed by them daily in London alone. During the Irish famine of the 19th century, in which as many as one million people may have died, the British government passed the Temporary Relief Act (also known as the Soup Kitchen Act) in February 1847. The Act amended the restrictions on the provision of aid outside the workhouses for the duration of the famine, and expressly allowed the establishment of soup kitchens in Ireland to relieve pressure from the overstretched Poor Law system, which was proving to be totally inadequate in coping with the disaster. Prohibition against soup kitchens was soon relaxed on mainland Britain too, though they never again became as prevalent as they had been in the early 19th century, partly as from the 1850s onwards, economic conditions generally began to improve even for the poorest. For the first few decades after the return of soup kitchens to mainland Britain, they were at first heavily regulated, run by groups like the Charity Organization Society. Even in the early 20th century, campaigning journalists like Bart Kennedy would criticize them for their long queues, and for the degrading questions staff would ask the hungry before giving out any soup. The concept of soup kitchens spread to the United States from Ireland after the Great famine and the concomitant wave of Irish emigration to the New World. The earliest ones were established in the 1870s. A sharp rise in the number of hungry people resulting from an industrial recession coincided with the success of the AICP, and the American branch of the Charity Organization Society, in getting various forms of "outdoor relief"[b] banned. This resulted in civil society establishing soup kitchens, to help feed those of the poor who did not wish to subject themselves to the regimented organisation of the Almshouses favored by the charitable societies. 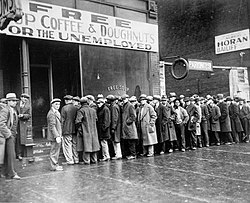 It is believed the term “breadline” entered the popular lexicon in the 1880s. It was during those years that a noteworthy bakery in New York City’s Greenwich Village, “Fleischmann Model Viennese Bakery,” instituted a policy of distributing unsold baked goods to the poor at the end of their business day. By the late 19th century soup kitchens were to be found in several US cities. The concept of soup kitchens hit the mainstream of United States consciousness during the Great Depression. One soup kitchen in Chicago was even sponsored by American mobster Al Capone in an effort to clean up his image. With the improved economic conditions that followed the Second World War, there was less need for soup kitchens in advanced economies. However, with the scaling back of welfare provision in the 1980s under president Reagan's administration, there was a rapid rise in activity from grass roots hunger relief agencies such as soup kitchens. According to a comprehensive government survey completed in 2002, over 90% of food banks, about 80% of emergency kitchens, and all known food rescue organisations, were established in the US after 1981. Presently, Catholic Charities USA of Colorado Springs, Colorado, founded by The Sisters of Loretto, provides food to upwards of 600-700 persons or more per day, and has been doing so since 1985. Use of soup kitchens has grown rapidly across the world, following the lasting global inflation in the cost of food that began in late 2006. The global financial crisis further increased the demand for soup kitchens, as did the introduction of austerity policies that have become common in Europe since 2010. Modern soup kitchens are generally well regarded, though like their historical counterparts they are sometimes disliked by local residents for lowering the tone of a neighborhood. The world's largest soup kitchen run at the Sikhs' holiest shrine, Golden Temple in Punjab, India, which according to Croatian Times can serve free food for up to 100,000 - 300,000 people every day. At the Langar (Kitchen), food is served to all visitors regardless of faith, religion, or background. Only vegetarian food is served and people eat together as equals. The institution of the Sikh langar, a community run free kitchen, was started by the first Sikh Guru, Guru Nanak. It was designed to uphold the principle of equality between all people regardless of religion, caste, colour, creed, age, gender, or social status. In addition to the ideals of equality, the tradition of langar expresses the ethics of sharing, community, inclusiveness, and oneness of humankind. Every Sikh shrine has a religiously sanctioned moral and humanitarian obligation to serve and provide hospitality, provisions, nourishments and meals to any man, regardless of race, creed, religious profession, identification, or affiliation. Food banks typically have procedures needed to prevent unscrupulous people taking advantage of them, unlike soup kitchens which will usually give a meal to whoever turns up with no questions asked. The soup kitchen's greater accessibility can make it more suitable for assisting people with long-term dependence on food aid. Soup kitchens can also provide warmth, companionship, and the shared communal experience of dining with others, which can be especially valued by people such as disabled, pensioners, widowers, homeless and ex-homeless. In some countries such as Greece, soup kitchens have become the most widely used form of food aid, with The Guardian reporting in 2012, that an estimated 400,000 Greeks visit a soup kitchen each day. Langar – a centuries-old tradition where vegetarian meals are supplied free of charge to the hungry at Sikh temples worldwide. Langar (Sufism) – an Islamic tradition where free food is provided. Masbia – a humanitarian organization in Brooklyn. The Susso – welfare in Australia originating in the Great Depression. Volxkuche – a type of food kitchen with a secular / alternative culture character. ^ Note that criticism of soup kitchens was only a minor driver of the 1834 law - the move was driven more by free market ideology and discontent with other forms of "outdoor" aid like the much more widely disliked Speemhanland system, see Hunger in the United Kingdom. ^ In the main, this meant ending the practice where municipal officials would give out small sums of cash to the poor. Unlike in Britain a few decades earlier, the US did not pass nationwide laws restricting private individuals from giving food to the hungry. ^ Although some soup kitchens also like to give visitors a second "carry out" meal. ^ Simone Weil (2002) . The Need for Roots. Routledge. p. 6. ISBN 0-415-27102-9. ^ a b c d Victoria R. Rumble (2009). "Chpt 29, Soup Kitchens". Soup Through the Ages. McFarland. ISBN 9780786439614. ^ Pat Thane (30 April 2011). "There Has Always Been a 'Big Society'". historyworkshop.org.u. Retrieved 9 February 2013. ^ a b Karl Polanyi (2002) . "chpt. 1-5". The Great Transformation. Beacon Press. ISBN 978-0-8070-5643-1. ^ a b c Lisa Bramen (29 December 2010). "Count Rumford and the History of the Soup Kitchen". Smithsonian. Retrieved 9 February 2013. ^ a b "The Shadow Behind Our Founding Fathers: A traitor, a scientist, a womanizer and an enigma" review of Nicholas Delbanco's The Count of Concord Book World p. 9, 22 June 2008, The Washington Post. ^ a b c Gwendolyn Mink and Alice O'Connor (2004). Poverty in the United States. ABC-CLIO. pp. 321–323. ISBN 1-57607-597-4. ^ Campbell Bartoletti, Susan (2001). Black potatoes: the story of the great Irish famine, 1845-1850. Houghton Mifflin Harcourt. p. 75. ISBN 978-0-618-00271-9. ^ a b James Vernon (2007). "Chpts. 1-3". Hunger: A Modern History. Harvard University Press. ISBN 0674026780. ^ Todd DePastino (2005). Citizen Hobo: How a Century of Homelessness Shaped America. Chicago University Press. p. 22. ISBN 0226143791. ^ Wetsteon, Ross (2003). Republic of Dreams: Greenwich Village, the American Bohemia, 1910–1960. Simon & Schuster. preface. ISBN 0-684-86996-9. ^ a b Janet Poppendieck (1999). "Introduction, Chpt 1". Sweet Charity? : Emergency Food and the End of Entitlement. Penguin. ISBN 0140245561. ^ a b c Andrew Walter (2012). William A Dando (ed.). Food and Famine in the 21st Century. ABC-CLIO. pp. 171–181. ISBN 978-1-59884-730-7. ^ "Marian House Soup Kitchen". ccharitiescc.org. Retrieved 3 April 2018. ^ Claire Bessette (14 February 2013). "Norwich soup kitchen hearing postponed". TheDay.com. Retrieved 15 February 2013. ^ "HOUSEHOLD FOOD SECURITY IN THE GLOBAL NORTH: CHALLENGES AND RESPONSIBILITIES REPORT OF WARWICK CONFERENCE" (PDF). Warwick University. 6 July 2012. Archived from the original (PDF) on 12 January 2013. Retrieved 28 August 2012. ^ Nick Squires (5 February 2013). "Knights of Malta to open soup kitchens in Britain". The Daily Telegraph. Retrieved 3 March 2013. ^ "SCOFF THAT - Free Food Daily For 300,000 at Worlds largest Soup Kitchen". croationtimes.com. 12 April 2013. Retrieved 17 September 2013. ^ John Henley (14 March 2012). "Greece on the breadline: how leftovers became a meal". The Guardian. Retrieved 9 February 2013. ^ Mat Clinch (8 February 2013). "Food bank visits surge, not just for the poor". GlobalPost. Retrieved 9 February 2013. ^ Clare Lissaman (25 January 2013). "'Community spirit' fuels Wolverhampton soup kitchen". BBC. Retrieved 15 February 2013. Glasser, Irene (2004). "Soup kitchens". In David Levinson (ed.). Encyclopedia of Homelessness. SAGE Publications. pp. 525–7. ISBN 0-7619-2751-4.